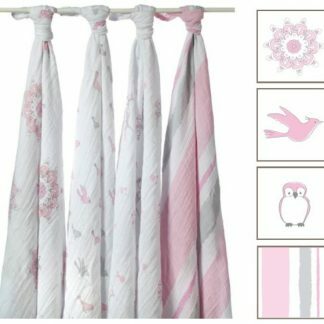 Aden and Anais’ For the Birds Classic Swaddle Blanket (4-Pack) offers a delightful girly design in pink, perfect for swaddling your little girl. Pink birds take flight against crisp white on one of the muslin swaddling blankets. 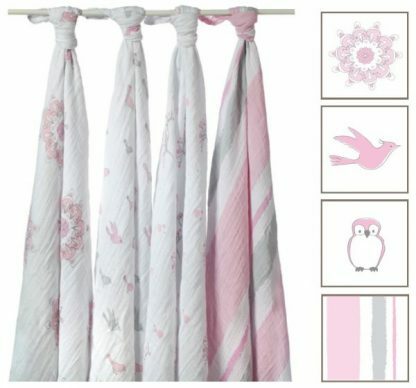 Cute pink penguins, an adorable floral motif and stripes and pink and gray adorn the other classic swaddle blankets. 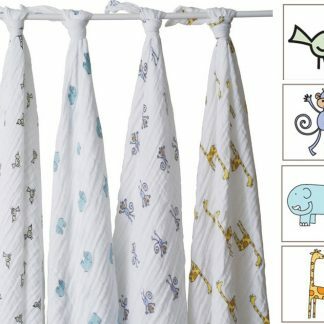 With four muslin swaddling blankets in this set, you can swaddle your baby girl in style! Muslin is breathable and comfortable, safe for your baby, yet it’s durable and strong and only gets better with age. The open weave and lightweight muslin fabric prevents the risk of overheating – one of the potential causes of SIDS, yet it still provides your little girl with comfort and warmth. The natural fiber in muslin swaddle blankets are able to withstand multiple washes, and they actually get softer with age. Aden and Anais original swaddle blankets are award-winning, single-layer 100% cotton muslin swaddles that are the ultimate in versatility, breathability and quality. 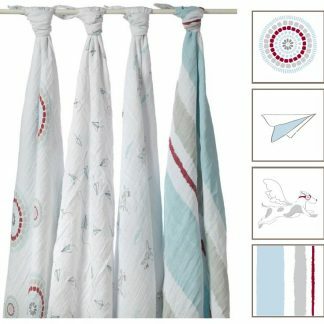 For the Birds Classic Muslin Swaddle Blankets are so versatile. 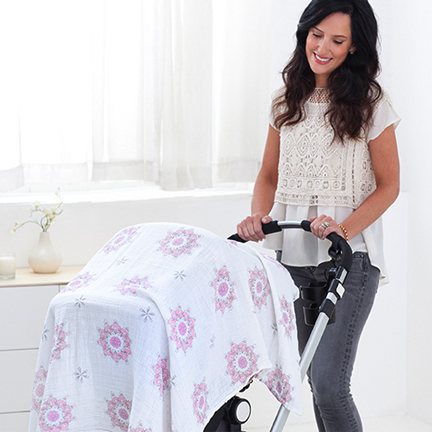 You can use it to cover your stroller, or as a nursing cover. 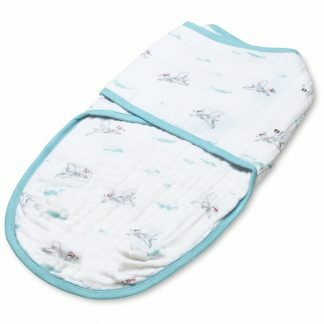 Other uses for Aden and Anais blankets include making it a tummy time blanket, burp cloth, and even your changing pad cover. 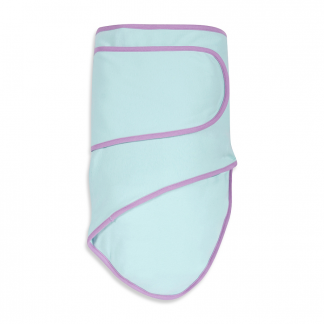 With a 47″ x 47″ pre-washed size, these muslin blankets offer you endless uses. All of Aden and Anais blankets are crafted out of muslin, a finely woven and breathable cotton fabric that has its origins in Bangladesh during the Middle Ages. 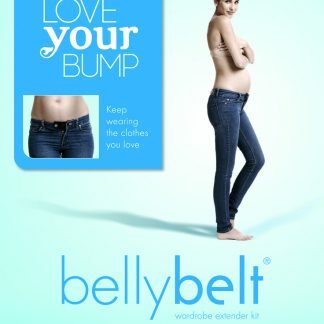 It is one of the most gentle, purest, and simplest fabrics in the world, safe and comfortable for baby. 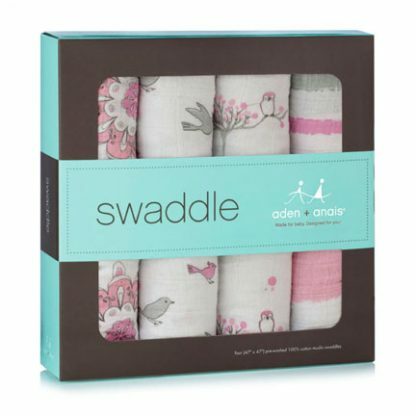 Babies love to be swaddled, and they love the feel and comfort of Aden and Anais muslin swaddle blankets. 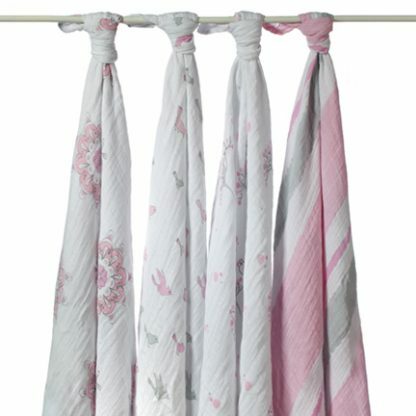 We love the feminine design of the For the Birds Classic Muslin Swaddling Blankets. 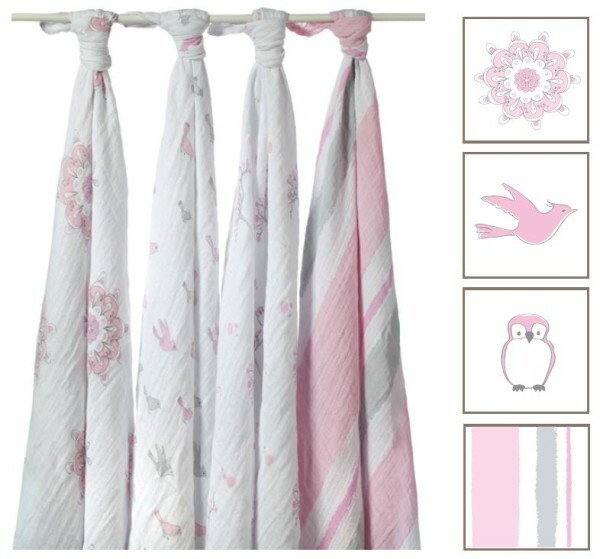 Pretty pink and feminine in an assortment of stylish designs – pretty pink owls sitting on tree branches, flying birds, pink and grey stripes and unique motifs. Made of 100% muslin. Mothers have been swaddling their infants since the beginning of time – since at least 4000 B.C. 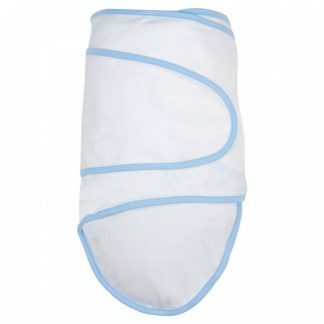 Swaddling soothes and calms babies; it makes infants feel cozy and secure, just like they felt in the womb. There’s also evidence that swaddling babies offers infants a more restful night’s sleep because it prevents the startle reflex from waking them up. 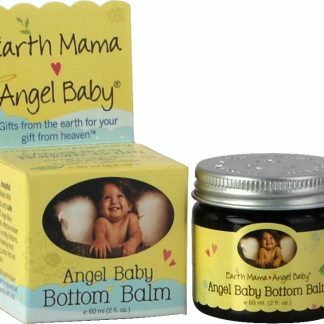 Although moms have been swaddling their babies forever, it doesn’t come easy for everyone. It takes practice, and it’s an art. There’s no right or wrong way; just find one that works for you and your little one!